So I was looking at my gorgeous Christmas tree, and it got me thinking: aside from the color scheme, what makes a tree beautiful? Clearly the placement of the decorations has something to do with it. But how should ornaments be placed? Ahh, that’s better! An arrangement like this could, in principle, be accomplished via actual random placement, but with independent draws replaced by some function of distance from prior draws. The more distant a given empty spot is from already placed ornaments, the greater its probability of being selected for the next ornament. And in reality, I suspect our minds are performing just such a process, or at least something similar, when we decorate our actual Christmas trees. if only people still tinseled their trees--would you have a similar hypothesis for tinsel distribution? Actually, I'd be tempted to suggest that we use some kind of variant of the flocking rules to place ornaments. Watch people actually place the things on a tree; they tend to put their arms up, then center in on a place not too far from a current seated ornament. There is likely some seed randomness in many placers' minds, but after that, pure flocking. ". . . random placement, but with independent draws replaced by some function of distance from prior draws. The more distant a given empty spot is from already placed ornaments, the greater its probability of being selected for the next ornament." First, there is the complex configuration of the tree (which your two-dimensional depiction utterly fails to capture Then there is the assortment of decorations at hand, which vary by size, shape, material, texture, reflective quality, etc. 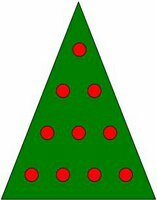 There simply are too many idiosyncratic variables (the set of decorations at hand) and a key, unpredictable one (the configuration of the tree) to permit the development of a tree-decorating algorithm that will lead to pleasing results, though yours points in the right direction. 1. String the lights in a spiral configuration from top to bottom, with roughly even spacing on the vertical dimension. 2. Place glass ornaments, beginning at the top, so that their size generally, but not slavishly, increases toward the bottom. 3. Begin with a "prominent" branch, then move to the nearest "prominent" branch. 4. Avoid clusters of similar sizes, shapes, and colors. 5. 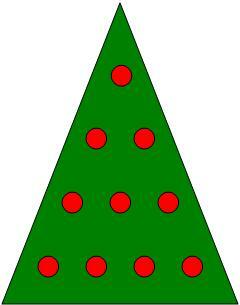 Use ornaments that are of larger diameter or elongated to "cover" recesses, as possible. 6. Fill in remaining recesses and gaps with non-glass ornaments. There's more to it than that, of course. Then there's the tweaking. And then, as they say, there's always next year, with a different treee and, perhaps, some new ornaments to work with. I think that the best Christmas decoration is happiness in your soul!Merry Christmas! 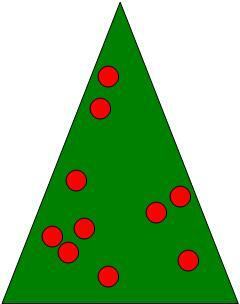 Randomization of Christmas Tree decorations requires a Poisson distribution with non-parametric tests. It really is possible to overthink this thing isn't it? 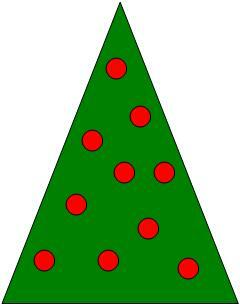 Since real Christmas trees are a three dimensional object and not just a green triangle, the actual tendency during decorating is to use the natural variations of the tree itself as the guide, and this leads to a slighly randomized result. So it is the "flaws" that make the tree interesting to the eye.